In order for Meier to make better pictures during his Great Journey, the Plejaren have constructed a special apparatus. 7. For this purpose we have constructed a special apparatus, by which you will be able to take better pictures with your camera – at least that’s what we hope for. 187. If you want, you can take some photographs here, but whether they will succeed I cannot judge. 188. Unfortunately, we don’t know whether Earth cameras can take pictures through the dome. 189. But we will know this after you have developed your film. 190. If you want, we can have the equipment brought from my beamship. I would be thankful for the photographic gear, Semjase, because it certainly should work..
1084. Now I have something to say. 1085. My daughter has now advised you several times to trouble yourself in a lesson-like manner for the spreading of the given to you concerns. 1086. You have prepared a lecture all right, but then not used it efficiently. 1087. We have allowed you for this purpose to get very good photographs of Semjase’s ship, and we gave this chance for photographing while with us on this trip (BMUFOR note: Great Journey). 1088. But until now you have not troubled yourself for any publicity with your lectures in fulfillment of your mission. 1089. This is very much unserviceable for our concerns, and this is irresponsible of you. 1090. As you do not trouble for that, you give bad service for our mission. 1091. With the new pictures from this trip (BMUFOR note: Great Journey), you are in possession of very much photo material, which now you must evaluate. 1092. It is un-useful for the whole matter when you now lock all the material away somewhere and leave it fallow. 1093. Your mission is to put this all together and to make it known to the interested public by giving explanations. 1094. It is no more suited anyhow, that you keep silence about these things, because the whole mission is of great importance. 1095. Only by such coming to publicity can you spread this knowledge and accomplish your mission for which you have been impressed in the form of a prophet, and you had undertaken this mission to yourself quite consciously and willingly. 1096.The time urges and you have to reach out to the public. 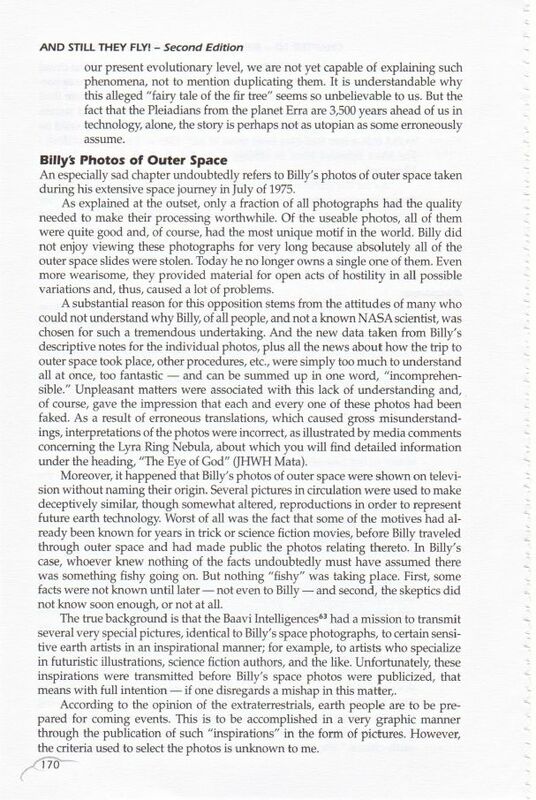 “Moreover, it happened that Billy’s photos of outer space were shown on television without naming their origin. Several pictures in circulation were used to make deceptively similar, though somewhat altered, reproductions in order to represent future earth technology Worst of all was the fact that some of the motives had already been known for years in trick or science fiction movies, before Billy traveled through outer space and had made public the photos relating thereto. In Billy’s case, whoever knew nothing of the facts undoubtedly must have assumed there was something fishy going on. But nothing “fishy” was taking place. First, some facts were not known until later — not even to Billy — and second, the skeptics did not know soon enough, or not at all. The true background is that the Baavi Intelligences (pg. 176 – [Baa-vee] Baavi Intelligence have an association with the Pleiadians and are called on occasion to perform special tasks for them. They live in the same Tayget SOL System and dimensional plane, as do the Pleiadians) had a mission to transmit several very special pictures, identical to Billy’s space photographs, to certain sensitive earth artists in an inspirational manner; for example, to artists who specialize in futuristic illustrations, science fiction authors, and the like. 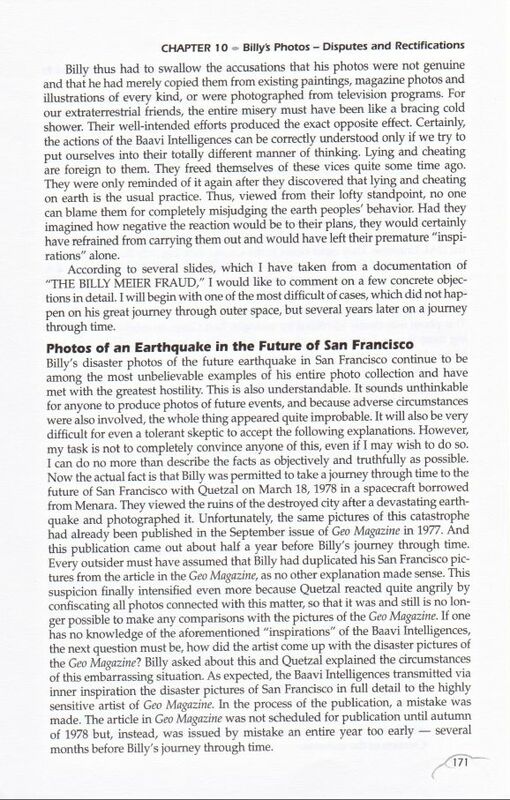 Unfortunately, these inspirations were transmitted before Billy’s space photos were publicized, that means with full intention — if one disregards a mishap in this matter. According to the opinion of the extraterrestrials, earth people are to be prepared for coming events. This is to be accomplished in a very graphic manner through the publication of such “inspirations” in the form of pictures. However, the criteria used to select the photos is unknown to me. Then another question: in the future, may we use the space photos snapped by me and make them publicly accessible? 36. That should be omitted under all circumstances. 37. I cannot give permission for this. 38. Too many factors speak against the fact that the images should be presented. 39. Already once before, we made the mistake of giving permission for publication, and it brought immense harm. 40. The people and the times have not yet changed sufficiently, that we could allow these pictures to be published, either in small circles or in the large public. 41. We must strictly insist that the remaining pictures are not used for any purposes. 42. Quetzal destroyed all of your own pictures, like also the pictures of San Francisco. 43. Only Guido is, according to our knowledge, still in possession of space pictures. 44. Nevertheless, he may not utilize these under any circumstances; otherwise, we would have to destroy these as well, which would cause us very much sorrow, because for a much later time, they will be of great utility, which Guido won’t experience, however, because this will be long after his time. 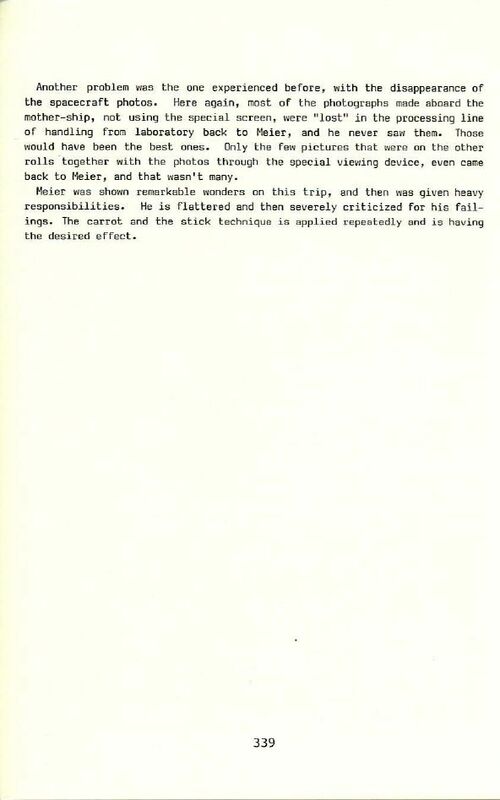 * This date doesn’t at all match with the date of Meier’s space journey i.e., between July 17-22, 1975 during which he allegedly photographed Asket and Nera. During correction work, you made a remark in regard to Quetzal and Ptaah. 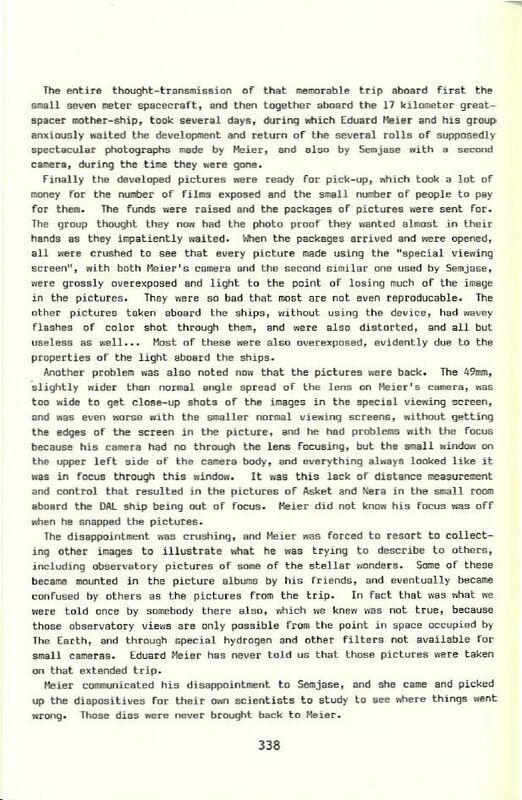 You said that you were instructed by them to explain something to me with respect to the beamship photos, our contacts and in accordance with the calumnies which appear again and again. 3. That is right, because Ptaah and Quetzal did not have the necessary time last Saturday for them to have been able to discuss these things with you, whereby they just now instructed me to. 4. This deals with the fact that even today, after more than 30 years of our contacts, malicious know-it-alls, critics and calumniators still cannot come to terms with the facts and with the truth that our contacts are real and also that your photographic material, which we instructed you to create, is genuine. 5. No matter how much evidence is provided regarding our contacts – for instance by witnesses of integrity who have seen our flying devices and have even seen some of us Plejaren ourselves, and have experienced things with you which have pointed clearly to our presence – all these things are maliciously and, as if they know better, criticised, whereby you are also slandered and accused of deception, of swindles and lies. 6. Since the beginning of the existence of our contacts and the release of your evidential materials starting from the year 1975, in this respect, again and again controversy has been triggered by malicious ones, by know-it-alls, critics and calumniators. 7. The truth of the contacts and the genuineness of the photographs and other materials were thereby called into question and malicious calumniators made accusations that they are deceptive and mendacious. 8. Recently, after such a long time, the attempt is now being made again by persons who are hateful and profoundly poor in intellect and rationality, as it is by Korff. 9. In his hatred of you, this man hurts himself, because in all the years of his efforts, with respect to his intrigues and calumnies against you, he was unable to accomplish anything. 10. So again he takes his hatred against you to start a new controversy, because in all the years he could not come to terms with never really being able to find something against you and against our contacts and against your photographic material, through which he would have been able to convict you of deception, of swindle and lies. 11. So, hatefully and in ridiculous ways, he fabricated impossible things, especially with regard to the photographic materials, which he cites as “proof” of his absurd claims and theories. 12. Thereto, according to Ptaah and Quetzal and from all of us who work together with them and discuss all necessary things with them, I now should advise that you and the Core Group members and passive members, as well as Michael Horn and others, in no further way ought to involve yourselves in any controversy in said form. 13. Also, in the correspondence as well as on the FIGU forums and with journalists and visitors, and so forth, the whole thing ought not to be gone into, and thus no questions relevant to controversy or other questions which are directed at calling the truth into question, are to be answered any more. 14. For the longest time, in the same way that evidence of the truth of our collective contacts has already been provided by many witnesses, as has the genuineness of your photos made of our beamships and various materials, which were given by Genesis III in the USA, to renowned scientific experts and institutions for scientific investigation and analysis and which proved that all the material corresponds to genuineness and that no counterfeits whatsoever are presented. 15. Also, the investigations on the sites and locations where the photos, and so forth, were made showed that all your data correspond to the truth and that no deception whatsoever is present. 16. This must finally be accepted. However, after all the evidence provided and after a time of more than 30 years, whoever – in regard to the presentation of evidence – still cannot accept this, is poor and paranoid in regard to intelligence and rationality. 17. Therefore, neither you, nor other members or friends and acquaintances, ought to react to further discriminatory machinations and questions, rather declare that the evidence of the genuineness and truth in regard to the contacts and photos, as well as other materials is sufficiently provided, consequently it is nonsensical to still continue to talk about it. Ptaah has privately briefly indicated that already, but then he did not speak to me any further about it. 18. It is for that reason that I was instructed to do it.